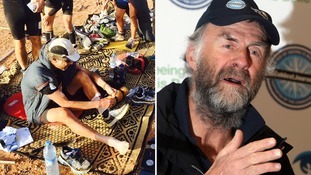 The famed explorer Sir Ranulph Fiennes is taking on arguably his most grueling challenge yet - a 56-mile run in the 50-degree heat of the Moroccan desert. Sir Ranulph, who is 71, is aiming to become the oldest Britain to complete the Marathon des Sables - which is widely considered the toughest footrace in the world. Having already run 62 miles across the Moroccan Sahara in three days, today's stage is the most punishing of all, and will see participants running more than double a normal marathon, taking around 20 hours. Sir Ranulph admits he has begun to feel the effects of the heat, particularly on his heart following two previous heart attacks and undergoing a double bypass. He said: "As I'm walking I can feel a cadence under the wire where they sewed me up - it serves as a warning that I need to slow down. "It feels like a rhythm behind my heart, it makes me feel dizzy and that is when I know I need to slow down. I think it is caused by the extra soft sand under foot or the inclines." Sir Ranulph's trainer, Rory Coleman said: "Even just walking a few yards takes such an extra effort." Sir Ranulph added: "You think you see the shimmer of a checkpoint but then an hour later you still haven't reached it." The six-day 'ultramarathon' covers a total distance of 156 miles, the equivalent of one marathon a day, with runners forced to carry everything they need on their backs. Sir Ranulph is running the race in an attempt to raise £1 million for the terminal illness care charity Marie Curie.